Each of us have known betrayal in our lives. Sometimes we feel betrayed by something small, sometimes by something great, but there is a mark left on us by an act of betrayal that takes a long time to go away. Somehow Jesus has sussed that Judas was about to betray him. He had lived his life waiting for this moment to come, a life always aware that he would end up on a cross. But he was also human, so he would have been hoping all along that something would happen that would change all this, somehow he would escape his passion. The hope of this escape was what led Jesus to plead with the Father three times in the garden, "If thou can, please remove this cup." 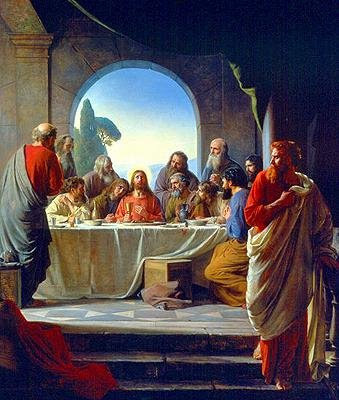 Jesus told the apostles quite openly that one of them was about to betray him and then he listened as Judas denied it. What a heart rending story. Surely this sitting at the table with the friend who was about to betray him was the start of the Lord's passion. As we come to the end of Lent, take time out and search where you have been betrayed, have you asked for it to be removed from your soul and if it has not, for the grace to embrace it as Jesus did in the cross.